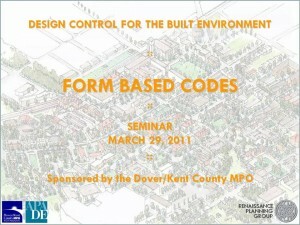 On March 29th, 2011, the Dover/Kent County MPO held a training session to discuss the advantages and limitations of Form-Based Codes in Zoning Issues. The Dover/Kent MPO invited planners, citizen planners, board and commission members, elected officials and interested members of the public to the event. Clarence Eng, of the Renaissance Planning Group, presented on a wide array of topics including the purpose and attributes of Form-Based Codes and how they fit with existing zoning ordinances. You can get Mr. Eng’s presentation in a PDF or view a video of the training session.